MY DEEPEST APOLOGIES. Even though it's been four entire months since graduation, my weeks continue to get busier and busier. My calendar is packed tight with work, appointments, meetings, get-togethers and everything in-between. And somewhere in there, I try to get some sleep. And my next week won't be any less busy. With an upcoming freelance article due ASAP, I apologize in advance for my irregular blog postings. 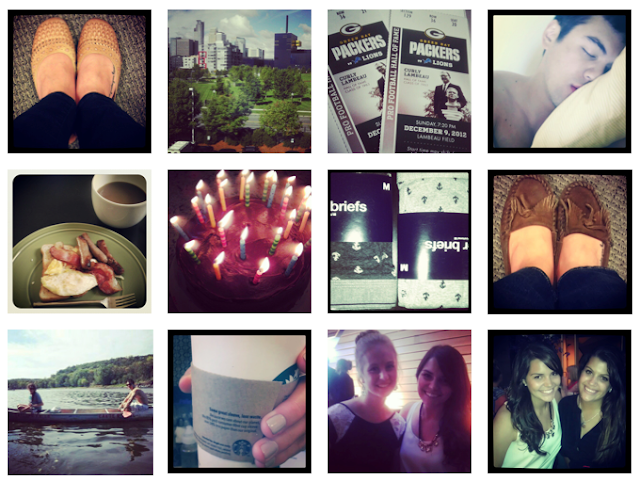 But somehow, in the midst of all that craziness, I still managed to take a few Instagram photos. In the past week, Jack turned 23 (oldie.) We went out for drinks, ate lots of cake and planned our trip to Wisconsin for the Packers vs. Lions game. That handsome guy made me breakfast, too. We went canoeing and I obsessed over anchor boxer briefs. I admired this beautiful city, got my dance on at a wedding and bought some new fall shoes.